Signs of spring are everywhere. It's hard to imagine so much of Europe covered with snow while here I see snowdrops nodding their heads under shrubs, daffodils and tulips thrusting pointed leaves through brown soil, and shoots of Siberian Iris standing four inches tall in their pots. Today, while eating lunch two robins flew across the yard and perched in the skeletal branches of the plum tree. 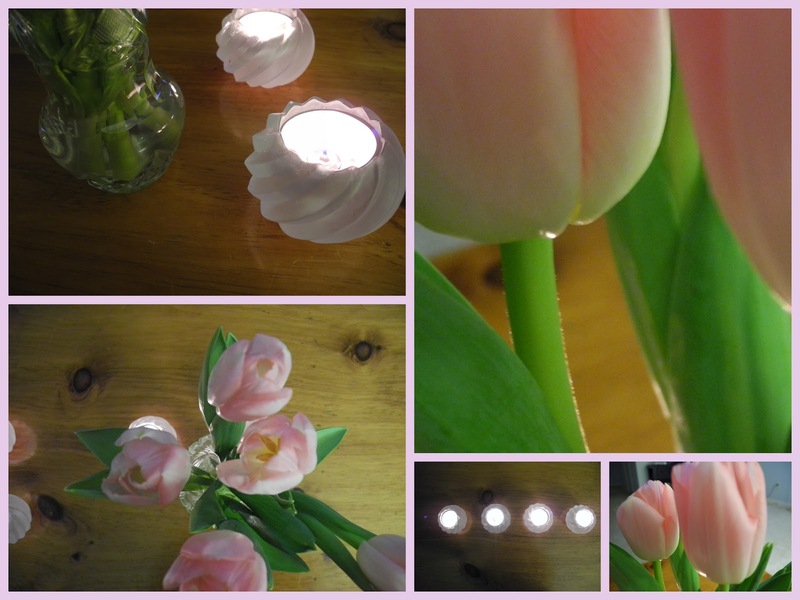 Last night I lit candles and enjoyed their glow against the pale pink tulips I brought home from the market. Beauty feeds the soul. Beautiful mosaic! I love the colors! I love pink and green together. And this mosaic just exudes peace and beauty. the pink tulips are lovely - and thank you for the beautiful quote from Anne Frank. Also thankyou for stopping by my blog - as to your question re the textures - I use Photoshop Elements - it is like a reduced version of Photoshop - cheaper and easier to use, still with lots of features - more than enough for what I want to do. I am sure you must be able to use other photo editing programs to do textures too. These photos are very relaxing. Thanks for sharing. I love tulips - especially at this time of year. Your pink ones are lovely. Thanks for visiting my little blog project. Such a happy mosaic. I was out looking at all the buds telling them to bloom...bloom well ye buds! Your tulips are gorgeous. I love that color. I had them last week too. Lovely mosaic. It was a beautiful weekend wasn't it? Did you see the sunset? I believe spring is on its way! With the warm temperature is does feel like spring, I also have snowdrops in flower. I will enjoy it while I can, colder temperatures in the forecast. Beautiful tulips. The thought of Europe covered in ice and snow is not nearly as thought-provoking as your enjoying spring-like temps. Yes, I'm identifying much more with Europe's weather. Lovely pale shades of pink...very spring like. Has your book arrived yet? Oh my! A happy post it is! Love the words of Anne Frank. Signs of spring are making me happy these days as well...and I am enjoying my own bouquet of pink tulips. Well, today is a beautiful day here in T.O. Sunny and we have 7 degrees...it certainly feels like Spring! Je mettrai mon blog à jour dès que possible et tu pourras t'en rendre compte. Beautiful flowers - they make me think of spring. I love robins - my favourite birds - messengers from heaven! We have been having very spring like weather on and off this winter ad I have been enjoying it! It makes life so much easier. Your pink tulips are lovely! Two of my fav colours...pink and green...Beautiful!